Writing about something like the One-Hour Theater Challenge, CTCs’ current offering, is a bit like trying to nail a bag of jelly to the wall – there’s no way to keep it contained or centered. In one sense, it’s a new play festival, with short works written primarily by CTC company members and associates. In another sense, it’s an acting challenge where that night’s assembled cast attempts to deliver 25 of these new works within an hour or face some unknown consequences. Both are true, but neither is exclusively the point. Director Ryan Hartigan takes these elements and forces an audience to engage in what could amount to something like a theatrical game show, but plays out as an immersion into what he terms “micro-theatre.” Each short play, selected by audience members based purely on title alone (Hint: Don’t assume that the wackier a title, the stranger the play) is given a fully serious treatment, complete with lighting, sets and props. The fourth wall is removed for as long as it takes to explain the rules and set up each piece, but once the timer starts, they’re going for all the marbles, whether it’s the surreal, dark family comedy of “Figgy Pudding” or the spine-tingling seriousness of “Terry Simpson Starring Terry Simpson” (which may or may not star CTC stalwart Terry Simpson). 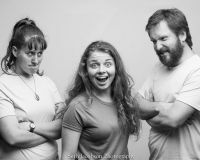 The One-Hour Theater Challenge contains many elements familiar to regular attendees of the CTC’s non-mainstage events, such as Micetro, the superb weekly improv show. Challenge is not improvised in any way, but the audience engagement and the familiar, bright tshirts are present and the cast has scant time to prepare their performances after seeing the final 25 plays selected right up to showtime. CTC’s annual 24-Hour Play Festival starts with prompts to the playwrights in order to grease the wheels, and all of these plays are also based upon similar prompts from CTC Artistic Director Chris Simpson. And, of course, anyone who saw the production of Too Much Light Makes The Baby Go Blind from several years ago will notice some of the key inspiration for the format. However, Challenge combines all of these characteristics into something new and unique. The format begs repeated viewings, not only in order to see all of the possible plays, but to see some of the same plays with different actors. The possibility also exists (and this is where the audience, especially a repeat audience, has power over the proceedings) to see the same plays in a different order. The effect is not unlike what would happen if you constantly hit shuffle on a 90-minute playlist, but only gave yourself an hour to listen. Sometimes, randomization will create an eclectic feast, or you may wind up in sentimental pool of tears. Hartigan states that One-Hour Theater Challenge may be “a cult classic in the making,” and he is not incorrect, especially since there is no room for complacency. New plays are constantly being added to the rotation and new actors constantly prepping for inclusion. Those who follow a band around because “it’s never the same show twice…and you don’t want to miss a classic” holds true here as well. Some of the pieces may hold up better than others, but that’s ok. If something doesn’t quite work, you only have a few minutes until it’s over and the next completely different one begins. The only fault that seemed evident in this early performance (Motif attended the second night) was the lack of urgency leading up to the time limit. The much ballyhooed “audience punishment” that would be meted out if the cast failed to perform all 25 plays in one hour did, in fact, occur. Perhaps it was because two of the slower, more thoughtful pieces occurred right before the clock ran out, but one would expect some frantic race toward the finish line and much gnashing of teeth. Instead, the clock politely ran out, the (admittedly nasty) punishment was delivered by a volunteer, and then the cast picked up right where they left off. It was hard not to feel a little slighted by the premise after that, but the payoff was that we got to see a few more terrific short plays instead of being sent out into the street wanting more. It would be tempting to end things that way, but it is the cast that is meant to be punished, not the audience. And, as the run progresses, they will find ways to raise the stakes a little more as the minutes tick closer towards the moment of truth. Another case made for repeated viewings of the One-Hour Theater Challenge. Bring your stopwatch. CTC presents the One-Hour Theater Challenge through Sept 5. 327 Main St, Wakefield. Call 401-218-0282 or visit contemporarytheatercompany.com for more details.